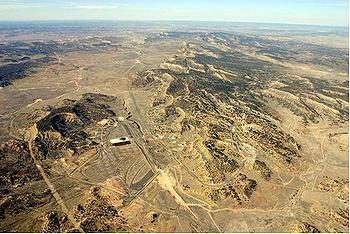 SANTA FE, New Mexico, September 29, 2011 (ENS) – The U.S. Environmental Protection Agency has approved a plan for the clean up of the largest and highest priority abandoned uranium mine on the Navajo Nation. Cleanup of the Northeast Church Rock Mine will include removal of some 1.4 million tons of soil contaminated with radium and uranium from a site that was operated as a uranium ore mine by United Nuclear Corporation from 1967 to 1982. Located near Gallup, New Mexico, mine adjoins the United Nuclear Corporation uranium mill site, a Superfund site managed jointly by EPA Region 6 and the Nuclear Regulatory Commission. At the request of the Navajo Nation, the EPA is using Superfund authority to investigate and clean up the contaminated mine site, in coordination with the existing adjacent Superfund site clean up. EPA says the multi-year cleanup will be conducted in several phases. The process will place the contaminated soil in a lined, capped facility employing the most stringent standards in the country. When complete, the cleanup will allow unrestricted surface use of the mine site for grazing and housing, according to the EPA. At present, the EPA says there is an elevated health risk for people who frequent the site from inhaling radium-contaminated dust particles and radon gas or utilizing contaminated rainwater and runoff that has pooled in the ponds. There is an elevated risk associated with livestock that may graze and water on the site. Exposure to elevated levels of radium over a long period of time can result in anemia, cataracts, and cancer, especially bone cancer, and death. “On behalf of the Navajo Nation, I appreciate the efforts of the US EPA and Navajo EPA, and the cooperation from the state of New Mexico to clean up contaminated Navajo trust lands,” said Ben Shelly, president of the Navajo Nation. “The completion of this plan is the result of years of hard work by members of the Navajo Nation and the Red Water Pond Road community, and I look forward to the day when this land is restored,” said the congressman. The disposal cell will be designed with participation from the Navajo Nation, the State of New Mexico, the Nuclear Regulatory Commission, and the U.S. Department of Energy. EPA will fund an independent technical advisor to assist the community in understanding the project as it develops and facilitate local input into the design process. 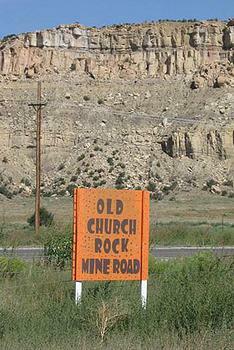 Northeast Church Rock mine operated as a uranium ore mine from approximately 1967 to 1982, and included an 1,800-foot deep shaft, waste piles, and several surface ponds. Under U.S. EPA oversight and in conjunction with the Navajo Nation EPA, General Electric, United Nuclear Corporation’s indirect parent corporation, conducted two previous cleanups at the site to deal with residual contamination, including the removal and rebuilding of one building in 2007, and removal of over 40,000 tons of contaminated soil in 2010. The largest release of radioactive waste in U.S. history occurred at the mine site on July 16, 1979 when an earthen tailings dam at the UNC Church Rock Uranium Mill failed. The mill’s radioactive fluids spilled into the Puerco River in New Mexico and traveled downstream to Chambers, Arizona. New Mexico Navajo and environmental justice advocates say the spill, combined with more than 20 years of discharges of untreated and poorly treated uranium mine water, has contributed to long-term contamination of the Puerco River in New Mexico and Arizona.